Frank Lampard oversaw a fine Derby display on Wednesday night. 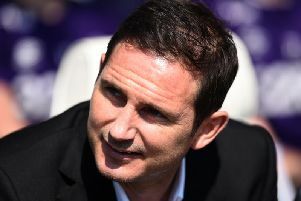 Frank Lampard gave a modest account of his Derby County side's display in beating West Bromwich Albion 4-1 on Wednesday night, but couldn't deny it was another huge win for the Rams. Derby produced one of their best performances of the season to move within two points of leaders Leeds and secure their second win over a fellow top five side in the space of four days. And Lampard was full of praise for his players. He said: "I wouldn't say it was our best display, I thought we played better against Brentford and Manchester United, but it was certainly the best result. "There were times where we perhaps our transition from back to front wasn't as slick as I'd like and one or two other areas where we could have been better, but overall we were outstanding. "For big parts of the game we were superb and against a side like West Brom that's very pleasing." Having beaten Sheffield United on Saturday and now the Baggies, Derby now head to another high-flying side in the shape of Middlesbrough on Saturday aiming to maintain their impressive form. Lampard said: "We're not top yet - it's very tight and there are other teams up there. It's a long season and we can't listen to any talk that we're going to go up and so on as that will cause us problems. "It's an unforgiving league but these two results show we're doing something right and we'll go into another very tough game on Saturday in great shape."